This article deals with roofing underlayment and is an offshoot of my roof repair project article. Here I tell you how I dealt with a situation where I could not nail down shingles. I had one significant problem related to replacing the shingles while roofing the eaves that skirted the flat porch roof. The eave from the flat roof cuts right under my eave for the hipped roof. See my picture to understand what I mean. The top few shingles I would install under that upper eave could not be nailed. I would have not room to swing a hammer. I couldn’t even use a staple gun. I would have to glue the shingles down. Unfortunately the previous installer had face the same problem and either did not glue anything down, or the glue failed. I could put my hand under there and tell that the shingles were not sticking to the sheathing. Even the roofing underlayment was loose. I was going to have to cut out these loose shingles all the way down through the roofing felt to the wood sheathing. This roofing felt acts as an underlayment. Roofing felt is either thin, like paper, or a little thicker, like felt, and is impregnated with asphalt. It is waterproof, but it does not stick to the sheathing by itself. It has to be nailed down. It is the most common type of roofing underlayment and is a good product. The asphalt on the felt will stick to the heads of the nails, so that the nails do not become a conduit for water to penetrate the sheathing. However it can be prone to tearing. 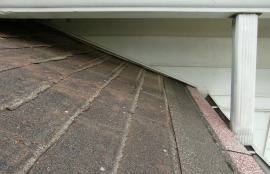 If wind damages the shingles it is likely to also lift up the felt, exposing the roof. I decided that I needed to use an underlayment that would be self sticking. I did not want water creeping in from the top edge and getting in under the felt. Because the eave above protected it from rain it would usually be dry under there, but either snow could blow under there, or water could creep in from the very edge of the upper eave, where it met the flat roof. I went to Lowes to see what they had. 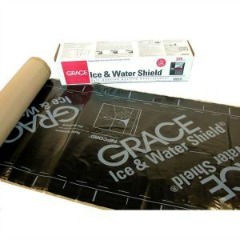 The salesman recommended a product by W.R. Grace called an Ice and Water Shield. It was sticky asphalt on one side and a heavy layer of polyethylene on the top side, but with a slip resistant texture. It was designed to cover the valleys of intersecting roofs. It would be perfect for my project, but the smallest roll covered 100 square feet. I only need a few square feet. Grace makes a variety of underlayments and flashing products. While I am not sure on this point they all seem to use the same basic butyl-based asphalt material and bond it to various forms of polyethylene. What I needed was a product that could be purchased in somewhat smaller quantities. I looked around and found that W.R. Grace also made a similar project, called Vycor, that was not recommended as a roofing underlayment but used to seal around door and window frames. The only difference appeared to be the lack of a slip-resistant surface. It clearly said not to use it on roofs, but I surmised that this was because it was slippery on the top side, or could be if wet. This product came in much smaller rolls, which was going to be much easier to work with and cost much less. I decided that the lack of access to this confined area meant I did not need a slip resistant surface, so I went with Vycor. What a great product! I loved it. I was able to cut small, easy to work portions and maneuver them into position with one hand and almost blind. I was able to even apply this flashing a little way up the wall to the bottom of the upper eave and seal it tight. I am quite sure that no water will dribble in under this flashing. After installing this flashing I glued the last few courses of shingles down with an asphalt-based roofing adhesive. While I did not use the Ice and Water Shield product I am so sold on the Vycor flashing that I am ready to recommend this product for roofing projects. It is primarily designed to be used in the valleys, where roofs join. In snowy climes the snow will sometimes form an ice dam at the base of the valley. Then water can melt but get trapped behind the dam. 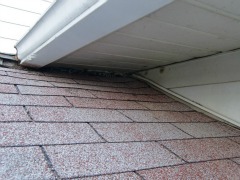 This standing water will eventually leak around roofing felt and leak into the house. With the Ice and Water shield this dammed water will not leak into the house and the product is wide enough that it is not likely that the dammed water will be spill over the area protected by the Ice and Water Shield. While not generally used as a roofing underlayment for an entire roof, it could be used in this fashion. Note: I do not have any commercial relationship with Grace. If their ads show up on my site it is because they have purchased that space through Google Ads. I have no control over who will advertise in these spaces. But feel free to check out their products. The after shot of my dead space. Visually I can't see any problem. I am confidant that water won't get past the Vycor, but the glue may not hold the shingles down over the long run.